This mailbox post is made from 3" round tube with a solid brass ball on top. The blacksmith forges the brackets from 1/2" x 1" iron bar. 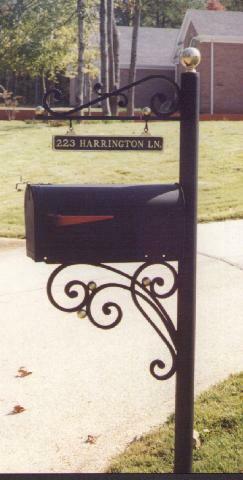 The gold balls on the wrought iron brackets are forged iron with a gold leaf finish this mailbox stand now comes with a newspaper box standard.